Remove Empty Directories (also called RED) is a pretty useful application for cleaning up your hard drive by removing empty directories. It can also remove directories that only contain useless files like 'Thumbs.DB'. 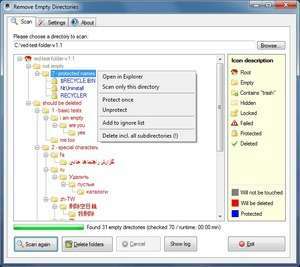 The main interface of Remove Empty Directories includes a tree listing of the directory you have selected to scan. For security reasons, you should also check out the Remove Empty Directories download at LO4D.com which includes virus and malware tests. Additional screenshots of this application download may be available, too. Remove Empty Directories download been highly rated by our users.